Lightningpaw moaned. All she wanted to do was curl up in her nest and sleep. The only time she wasn’t hungry was when she was dreaming. She shook her pale ginger fur, stretched, and stood up. The other apprentices padded out after her to the clearing and sat down. The apprentice nodded to Birdpaw, who sat to her left, and Dashfoot, who came over and sat on her right. Blizzardkit tumbled at her paws, ecstatic to be able to attend so many Clan meetings. Lightningpaw blinked up at the Highledge. Cakestar was leaning feebly on Copperclaw’s scrawny shoulder. What was wrong? The cats nodded. Hazelburrow was looking up eagerly, itching to be picked for the patrol. Suddenly, Lightningpaw didn’t feel sleepy anymore. She eagerly clawed the ground. “You’re only a kit!” Lightningpaw reminded her, crouching down to eye level with her clanmate. “Don’t remind me!” Blizzardkit moaned. Purring, Lightningpaw turned her attention back to Copperclaw. The cats on the patrol followed her while the cats going out hunting followed quickly behind them. “Good luck,” Lightningpaw murmured to Dashfoot as the two patrols split up. Rolling her eyes, Flowerstream turned her head. “Not to mention the badger might be nearby!” Hazelburrow nodded. 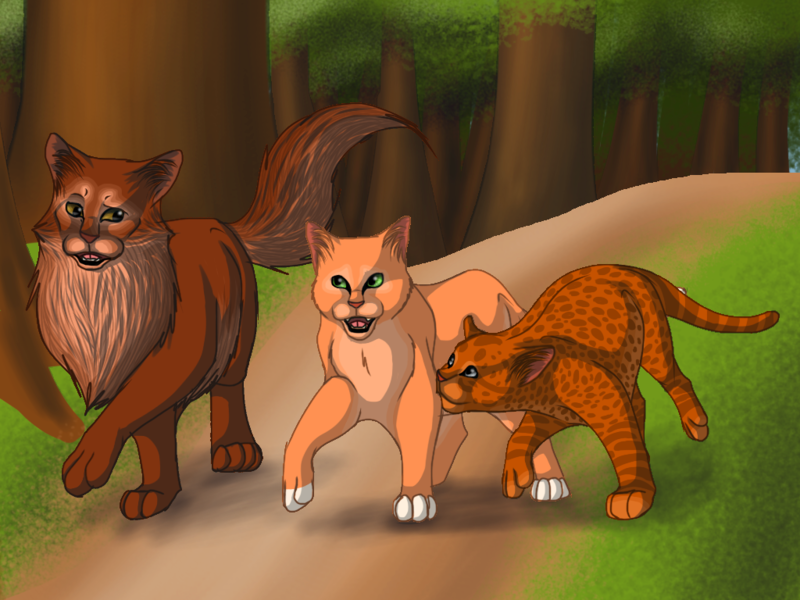 Swiftfire, who had been trailing behind, hurried up to beside Sparkpaw and Lightningpaw. Lightningpaw nodded. Just yesterday, she had seen three birds and missed every one of them. Lightningpaw opened her mouth to reply, but was cut off by the surprised meow of Hazelburrow. “Did you step on a thorn?” Lightningpaw asked the tom. Lightningpaw peered past his fluffily bright orange fur, to find blossoming, yellow flowers surrounding an oak tree. “Is that an herb?” asked Flowerstream. “Coming!” mewed Swiftfire, striding after their deputy, with the others not far behind. Hazelburrow paused for a heartbeat to grab some of the herbs with his teeth, and Lightningpaw did the same. They travelled on for a few more minutes, and then they found a large beech tree. “This is where we will set BlogClan’s first border,” declared Copperclaw. Copperclaw looked around. Her gaze landed on something on the forest floor. “What is it?” asked Hazelburrow. “We’ll drive it out!” Flowerstream meowed. After marking the new borders, Copperclaw stayed behind to check the area for any other signs of the badger, so Lightningpaw, Hazelburrow, and Sparkpaw presented the flowers to a very pleased Dawnmist, and she confirmed that the plant they found was marigold. After Lightningpaw and Sparkpaw left the medicine den, Hazelburrow stayed behind and started murmuring into the silver tabby’s ear. Lightningpaw shrugged. They had been some of the first Blogclan members. It made sense for them to be friends. Before this whole “turning into cats” experience, they had been on the blog for a very long time, and they were finally talking in person. Cat. Whatever. The murmuring grew louder. She pricked her ears. Were they arguing? Lightningpaw backed away. She must have been misunderstanding. Hazelburrow was a loyal warrior, he wouldn’t think of having a relationship with a medicine cat, and now of all times. Lightningpaw shook her light ginger head. She must have misunderstood. She shouldn’t have even been listening to their conversation, anyway. “What’s up?” asked Dashfoot as the tan she-cat padded into camp with a baby mouse she was holding by its tail. Lightningpaw turned to her clanmate. “Fine. I see the hunting went okay,” she replied, eyeing the young mouse in Dashfoot’s jaws. Just as she spoke, the fluffy cream coloured she-cat walked into camp, dropping one mouse by the elders and the other by the waiting kits. Dashfoot padded to give her mouse to the elders. “Are you sure?” asked Dashfoot. But by the time the tan warrior had made it to the nursery, the kits had devoured their mouse and were fast asleep in a pile of kittens, reminding Lightningpaw of a picture you could find if you search “cute kittens” on Google. So Dashfoot and Lightningpaw, who had been following the warrior, brought it to Dawnmist, who took one bite and continued to pace around her den, organizing herbs. “You two have the last bites,” she meowed distractedly. Hesitant, Lightningpaw bit into her mouse, relishing the flavour of fresh meat. Dashfoot then took a bite, and that was it for the mouse. It had hardly been more than a few mouthfuls, but at least it was something. Lightningpaw sighed and walked to the apprentices den. She wished that the Clan wasn’t so hungry. Flopping into her nest, Lightningpaw considered how Hazelburrow and Dawnmist had been talking. Surely, she had misunderstood, right? Dawnmist had stated that she was the medicine cat, but didn’t Hazelburrow say that since they were the only real Clan, Blogclan could make their own code? Did Hazelburrow have feelings for Dawnmist? And judging from the pain that Dawnmist had threaded in her voice, she might care about him, too. It was definitely possible. I’ll just let Dawnmist and Hazelburrow work it out for themselves, she decided, and she felt herself drifting into sleep. A sudden, alarmed yowl split her ears. It sounded like Copperclaw. She stood up from the scratchy surface of her nest. Racing out of the den, she found Copperclaw, her fur ruffled and her eyes wide and terrified. Cakestar hurried out of her den. “What happened, Copperclaw?” she demanded. Copperclaw was breathing heavily. “The badger…near camp…tried to attack,” she puffed. Cakestar opened her mouth, but she was interrupted by a painful cough. Copperclaw, still breathing quickly, straightened and kept Cakestar steady. Copperclaw was quickly followed by Dawnmist and Silverwind. Cakestar looked like she wanted to protest, but her throat scratching coughs kept coming, and she was led reluctantly to her den by Copperclaw and the two medicine cats. Not far away, Blizzardkit and Flamekit’s eyes were round with fear, and they were trembling. They had heard the panic. Lightningpaw curled her tail around them, even though she was as scared on the inside as they were showing on the outside. Cakestar was ill, the badger kept moving closer and closer to the camp, and the entire Clan was starving. 74 Responses to "Trailing Stars, Chapter 12; by Lightningpaw"
Agh! I wanna write something, but no one is taking any notice of me! Oh, Leappaw, people are taking notice! It’s just all the chapters are taken. When will the next chapter be written????!!! !